L to R Sue, Sandi, Jim, and I at the put in at Eton. This was a little bit different type of Agawa trip for me this year. It was also a trip a few years in the making. For those of you who don’t know Sue & Jim are the Authors of “In the Footsteps of the Group of Seven” and have a “small” passion for visiting and finding Group of Seven locations across Canada. 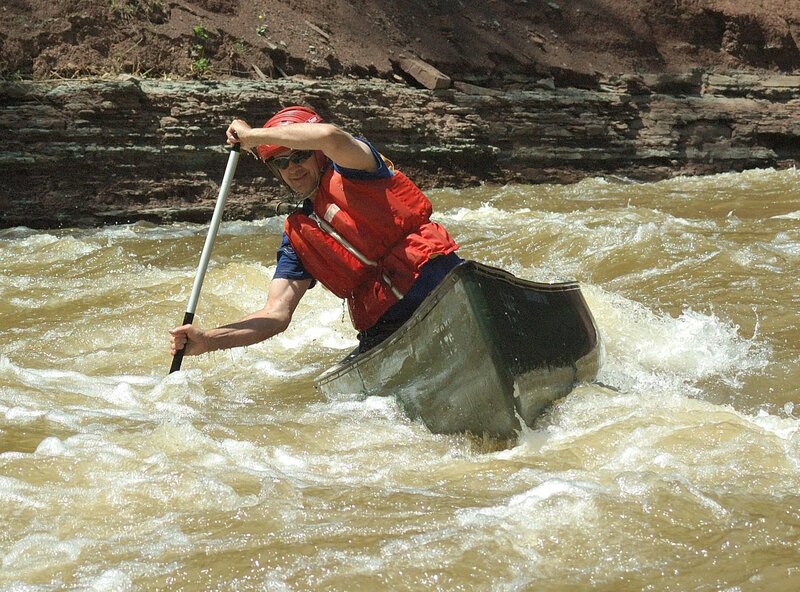 Even though the Waddingtons have been paddling for 60 years this was to be their first white water trip, which introduced some issues that needed to be addressed. My wife Anne and I had taken my son down the Agawa just before he was 2 in 1989 so I knew that taking them down was quite possible if….. The river levels were within a specific range not too low or too high or the weather would be favourable and I could arrange to get two or three good WW paddlers that could paddle a tandem like a solo and or act as a Sherpa canoe carrying gear. All was going good till a few weeks before departure when injures took out 2 and the 3rd. could not make the departure date and the time needed for a slow paddle down the river. So panic started to set in but Naturally Superior Adventures of Wawa set me up with local Wawa paddler Sandi Lowe. By a stroke of luck she was going to be in the GTA and we were able to have a meet and greet with a short paddle in Port Credit with Sue and Jim and all went well so the trip was on! The Agawa does not have a flow gauge on it but there is one on the Batchawana to the south and Wawa Creek to the north, so you have to make your best guess. Having been recording the flows on my trips since 85 so I was quite comfortable on what flow levels that we could go reasonalbly safe down the river. The Agawa is historically prone to flash floods and this happened on Sept. 5th, the river went from drought levels to extreme flood levels in a couple of hours so now the worry would be if the river was too high. The sand bar in our group picture above was newly deposited in that flood and added more than 1 metre of new sand. This makes it a whole lot easier to understand the flash floods and very quick rises in river levels 3.0 (70 cms.) on the left side is flood level (green line) The Batchawana and the Agawa are not dam controlled so being aware what can happen with levels is very important to your decision making when on the river. So Plan “A” extreme low was to get Shaun Parent of Superior Exploaration, Adventure & climbing to take us in by Quad and use his ice climbing Baker tent and base camp from there. Plan “B” high water, would be to paddle in and out from Eton and base camp at our first site. Flood levels would have nixed it all! Well I am totally surprised that the week we took Sue & Jim down the Agawa ended up being the best week weather wise and water level wise since the first week of Sept. (and weather wise our week wasn’t great either!) On October 11 up there in Algoma, they were experiencing huge flood flows. I estimate that when we started the water flow was around 27 cubic metres per second (cms.) and when we finished about 40 cms, flood stage for the river is around 70cms and on the 12th. it was 520 cms and still rising. So we were truly lucky and blessed on our trip. I estimated the flows a little higher because the Wawa creek gauge showed much higher levels than the Batchawana gauge meaning there had been more rain in the Agawa watershed than the Batchawana water shed which is one of the reasons I become an extreme weather watcher the month before trip. The Agawa is not a beginner WW river, over the years that I have paddled it there has been a number of deaths and boats lost to the rocks and the rapids can be deceptively fast. Even last year two paddlers had to use the Rail road workers to get them out. On a paddle prep, I was quite happy with the Endorsement of Sandi from Naturally Superior Adventures and her recent return from an extended 6 week canoe trip in the Northwest territories. That trip alone said alot about her skill set. On a personal prep note I had over 1500 k of paddling so far this year but as time grew closer I got out my ropes and practiced some throw rope tosses, “Z” drag set ups and a new rope skill (to me) a “Munter Hitch” which is incredibly easy to learn and such a wonderful tool to add to your skill set. We were to meet at the Agawa Bay Campground on Sept 21 for a “last supper” and to arrange our gear for the 3 hour logging road drive to the put in the next morning. Even though the big lake was a little breezey with waves around 2 m we were blessed with a famous Agawa Bay Sunset and just like the river the view is always eye candy! Anne at the Agawa bay beach. It was a pretty noisy night at the Agawa Bay campground, and it wasn’t the transport trucks on Hwy. 17, it was the winds and the waves pounding on the beach, but the winds died down and the skies cleared in the early morning hours. After a hearty breakfast we got started on that 3 hour logging road drive and the last forecast we got before we lost contact with the real world was pretty good, not too hot, not cold and not overly wet…. oh that was such a tease! and that forecast would stay on the phone until I took it off airplane mode a week later. We got on the river just after 12 noon under cool temps and partly cloudy skies. Images are by Anne as we departed on our adventure. Our adventure had begun and so had Anne’s unexpected adventure. Lets just say we will both be happy when the passenger rail service starts up again. I have been very appreciative that Anne has been able to do the shuttle for us because logisticly this is another major hurdle that needs to be addressed to get into this area. As beautiful as these backwoods areas are they can be brutal on a vehicle. Anne did get to see more wildlife than us, she saw a deer and a wolf but, her adventure was not over yet, she had to still get back to Agawa Bay on the spare and wait till Monday before she drove back to the Sault and get a new tire, it definitely was not the type of adventure she usually has while I am on the river. One of the goals of the trip was to get Sue and Jim to paddle into the G7 locations along the river when condtions would allow it, and the first was not too far downstream and the conditions were great! Note: Due to painting copyrights if there is a link to the painting I will post it. Some we have others we might have a copy of the painting but can not post it. Sue & Jim paddling in to the first A Y location of the trip. Into the painting 🙂 Which in this instance is the triple falls behind Jim. Next on this location was to find the position that A.Y. painted from and as you can tell by the smiles I think they found the spot! This falls does have a lot more to add photographically and as in many of the G7 locations in the Canyon you have to wonder if there are there are more paintings to be found. It is just a short paddle from the Eleven Mile Creek falls where it enters the Agawa to the where we have to portage to get to our first campsite. The Canyon narrows quite dramatically and you can here the roar in the gorge below. At these higher flows there is no takeout at the top of the rapid as the river drops right into Class V rapids and there is no eddies to catch and where you can get out above it the rocks are very loose. We made quick work of the carry from the top to the path that leads down to the campsite and quickly cut out a deadfall that was blocking the way at the bottom. We set up camp fairly quickly and I started to soak the corn for the nights dinner it was time to look at a couple of Lawren Harris Locations right at the camp. The weather was cool but the rocks were dry for walking up the river side and the skies were still nice, but the afternoon shadows were quickly taking over the canyon floor. After being happily satisfied with the findings it was time to move on to another A.Y. Jackson location. On the way up we discussed the various other artists who have painted here including Sidney Johnson the train surveryor that worked and painted here in the winter of 1901. We also wondered how important this location might have met to the the First Nations Peoples when I showed them the “Bear Face” a natural rock formation. With the trees growing back it is very hard to see from the tracks now. This image is from a previous trip. It is not an easy climb to get up the canyon side as the rock debris from when they blasted an opening in the cliff face for a hydro line in the 50’s is still very loose. We could not really get any higher for the view as tree growth would have obscured the view. This from an earlier trip October 2014 and you can see how the cliff side forest is slowly returning. You can see how A Y used the colours he did in his painting. Going down was a tricky go, Sue Making her way down. Jim and Sandi, it is much steeper than it looks. So time to head back to camp for what has become my first night traditonal dinner. BBQ corn on the cob, baked potato and sirloin steak! In this pic the first course of the corn is done and waiting for the second course. Going back in time at night with a little B&W fun sitting around the fire and thinking of who as visited and used this old campfire site, the Railroad workers the loggers, and most likely the G7 would have had a shore lunch here as they painted. As everyone headed to retire for the night I stayed by the fire to listen for an update of the forecast on my weather radio, and true to typical Northern Ontario weather it had changed for the worse. This probably happened because we did not adhere to the sacred rule of you should put up your tarp no matter what is in the forecast. Not only were they calling for colder temperatures but also rain! With the ridgeline and quide lines already attached I made quick work of getting it up just in time for the rain to start. When you are in the canyon, it has it’s own micro climate that can increase the severity of what is forecast so hopefully you are prepared enough for what may happen. Great story Jeff. Thanks for the mention. Great story, amazing photos, and a lifetime of keeping the Group of Seven at the forefront of the art world. Jim and Sue, you have contributed a great deal to educating myself and many others. Thank you for that! Previous Phone Photography, Can I get great shots on my phone?